Fast energy gel- no need for water. When you need a fast convinient energy boost. We designed the worlds first isotonic energy gel to be clean in the mouth & easy to digest. Our patented product means it delivers energy fast without the need for extra water. Winner of the Queens award for enterprise, this innovative product continues to be seen at the forefront by endurance athletes. Use during endurance sessions & events to help avoid flagging. World's first isotonic energy gel. Natural flavours. Low sugar. Suitable for vegans.We designed the world's first and only isotonic energy gel to be clean in the mouth and easy to digest. Our patented product means it delivers energy fast without the need for extra water. 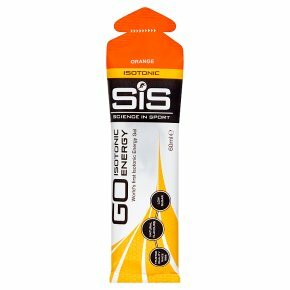 Consume up to 3 sachets per 60 minutes during exercise as required SiS Go Gels do not need to be consumed with water to be effective. Ensure you keep hydrated.